Information Technology, Arabic, Applied Mathematics and B.Tech in Electronics and Communication, Computer Sciences & Engineering and Information Technology. ation TechnoloThe University campus is located at the foothills of the great Himalayan Pir Panjal range in Rajouri, 154 KM from Jammu, the Winter capital of Jammu and Kashmir State. Regular bus service, video-coaches and shared taxies meandering their way by the sparkling streams through the thick-pine forests make the 3 and half hours jounery between Jammu & Kashmir a mesmerizing experience. The region in which the university is located has rich geographic, climatic and cultural diversity. The climate varies from subtropical in the southern parts to temperate in montane northern fringes. The average temperature varies from 7ºc during winters to 37ºc during summers. The average annual rainfall is 500 mm. The snow-capped peaks of the mighty Himalaya, rich biodiversity and valuable agri-diversity make the entire Rajouri-Poonch region a nature lover's paradise. The teaching programme designed by various Academic bodies of the university are interactive, flexible and hands on; directed towars helping learners to gain the ability to confidentl and effectivel answer real life challenges. "Steady onward march for human development through science and technology on one hand and our national ethos on the other"
"Work towards preparing men and women who are intellectual advennturers and not camp followers; who are architects of the future and not curators of the past"
Round the Clock DELNET facility for faculty as well as students. Full fledged Placement Cell with whole time Placement Officer to ensure high profile placement for pass outs. Regular study tours to industries and national institutes in different states of the country. Guest lectures by eminent scholars from within and outside the state. Seminars, Group Discussions, Presentations and Conferences. 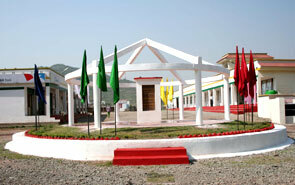 Excellent in-Campus Hostel facility for boys as well as girls. Residential in character 100% in campus excellent housing facility for teachers. Provision of handsome schlarships for nearly 60% of the total students enrolled per session. Strict adherence to Academic calendar.